Leo Breiman (January 27, 1928 – July 5, 2005) was a distinguished statistician at the University of California, Berkeley. He was the recipient of numerous honors and awards, and was a member of the United States National Academy of Science. 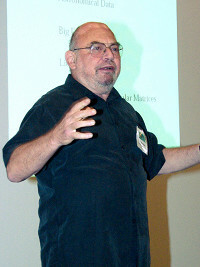 Breiman's work helped to bridge the gap between statistics and computer science, particularly in the field of machine learning. His most important contributions were his work on classification and regression trees and ensembles of trees fit to bootstrap samples. Bootstrap aggregation was given the name bagging by Breiman. Another of Breiman's ensemble approaches is the random forest. Breiman, L. (2001). "Statistical Modeling: the Two Cultures". Statistical Science. 16 (3): 199–215. doi:10.1214/ss/1009213725. JSTOR 2676681. This page was last edited on 27 August 2018, at 14:18 (UTC).